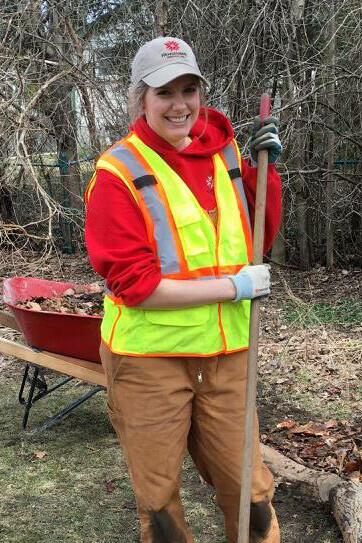 Fanshawe Colleges students, Geoffrey Trenholm Tobias Edwards and Lisa Norton (below) help with the clean up of the park. 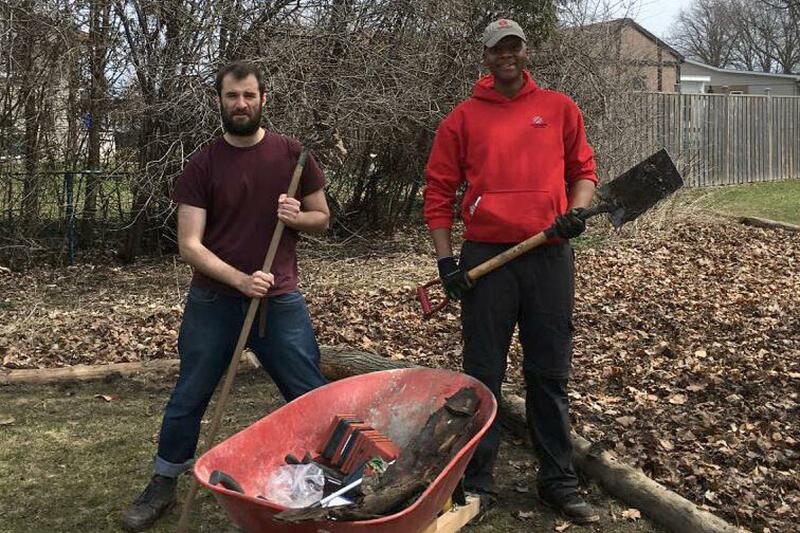 On April 21st, volunteers from the London Student Chapter of Landscape Ontario spent a few hours to “Clean and Green” Culver Park in London, Ont., in celebration of Earth Day 2018. After months of lulls and setbacks, I was joined by Fanshawe Horticulture Technician students, Geoffrey Trenholm, Tobias Edwards, and Lisa Norton (who drove all the way from Strathroy, Ont. ), who were happy to finally do their first work on the project that didn’t involve just garbage clean up. There was great initiative and energy for the project, and we all shared great ideas to make the short two-hour project a neatly-completed reality. Our work included the installation of a garden bed using only materials salvaged from the park itself. Irises, daylilies, and other donated bulbs were planted under a pre-existing tree, with leaf-mulch gathered from piles around the park (and combed for trash). Fallen logs were cut with hand-tools and used to line the bed. There is much more work we are anxious to do, and we can’t wait to see the plant material in full-bloom! The Student Chapter would like to extend their deepest thanks to Landscape Ontario members Wendy Harry, Matt Hart, Heather Jerrard, and Pam Cook, for their involvement and assistance with this Culver Park “Clean and Green” event. Its success was due in no small part to their encouragement and assistance. Thanks also to second-year student, Matthew Marrison, for donating plants from his personal collection, and to all the members of the Student Chapter who were unable to attend, but whose previous dedication helped us to achieve this groundbreaking event.